You won't see this cruiser on every street corner. First, because this gorgeous masterwork was created by Arlen Ness, America's premier designer of custom motorcycles. Second, because we're only building a few hundred of them. But those few hundred riders lucky enough to add this limited edition to their cruiser collection will be the envy of everyone, everywhere. Fully optioned, with radical paint and chrome, it's as breathtaking to look at as it is to ride. The Limited Edition Arlen Ness Signature Series isn't for everyone. 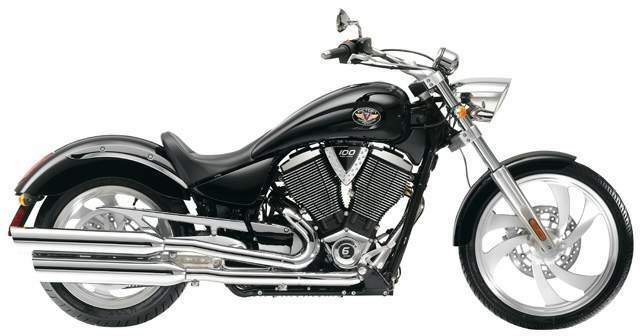 But when you're dealing in art as powerful as a Victory® motorcycle, that's exactly the point. THE VICTORY NESS SIGNATURE SERIES JACKPOT CUSTOM. IT’S STANDARD. indelible mark on the Victory style. Custom before custom was cool, they’ve once again created a masterpiece of extreme custom styling. With custom-designed paint schemes, signed side covers and limited-edition custom Danny Gray seat covers. Completely Nessed-out, these bikes are nothing short of hypnotic. From the billet wheels, engine cover inserts and custom-style mirrors. To the chrome swingarm, foot controls, engine covers and forks. It’s a true chrome and billet gold mine. Unmistakable. Undeniable. And unquestionably limited to a low production run. So decide now. Will you be one of the lucky owners? Or one of the lust-ridden admirers?